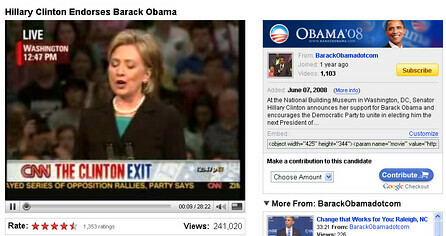 Hillary Clinton’s speech endorsing Barack Obama is the “News & Politics” most viewed video of the day on Youtube.com. Interestingly, this video was submitted by BarackObamadotcom. Once again we see the great work of Obama on User Generated sites. Same pattern is found on blog citations, although a close match, Obama constantly received more attention. Wouldn’t you say that the presidential race is presenting a clear correlation between on-line and off-line success? I genuinely appreciate your web page. Thank you for your insights and guidance. Hey nice blog, simply checking out some blogs, appears a fairly good platform you are using. I’m presently using Drupal for a few of my sites but seeking to change one of them over to a look very much like yours as a test site. with thanks about your posting. incredibly gud. Hello There,Pretty nice post. I just came upon your site and wanted to say that I’ve truly enjoyed browsing your blog posts. In any case I will be to enjoy more and I hope you continue to write again soon. A Very Nice Work ! Thank you, very much. Really good article! Totally interesting and engaging. I was trying to subscribe to your RSS feed but I couldn’t get it to work in Google Reader. Is RSS enabled on your blog, or am I doing somthing wrong? a terrific submit and thanks for placing it up! fantastic publish I wish to say thanks! wonderful post I would like to say thanks! It is very rare these days to find blogs that provide information someone is watching for. I am glad to see that your blog share valued information that can help to many scaners. thank and keep writing! I just love my square grand piano, would any person know exactly where to get them restored? I definitely wanted to make a small note to be able to thank you for all the unique tips you are writing on this website. My prolonged internet lookup has at the end of the day been recognized with useful ideas to share with my two friends. My ICQ:891679933I ‘d express that most of us readers are unquestionably fortunate to be in a magnificent community with so many brilliant professionals with very helpful methods.